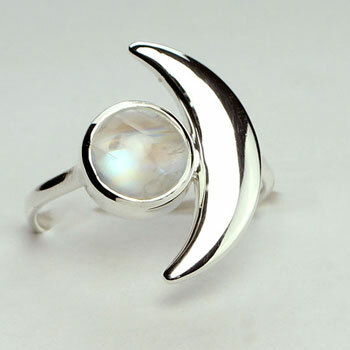 Your store will stand out with our latest Moonstone Goddess Collection. 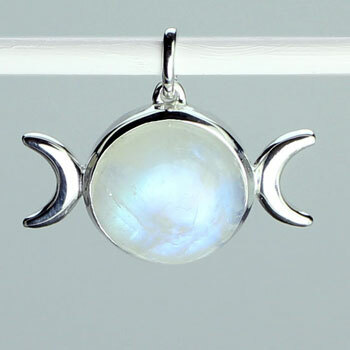 Go to our website now for the most lustrous glowing rainbow moonstone ever! 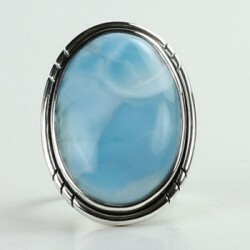 Our website offers over one thousand artisan designs in stock ready to delight your customers and improve your sales. Free Shipping on first orders for new customers. Tell Me What You See She searched out high quality Larimar in the rough and then works with her stone cutter to show him the shapes she wants for her designs. 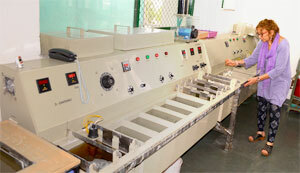 See How They Shine Elaine oversees the polishing to assure a triple polish on her Larimar cabs. With Love From Me To You One of many of Elaine’s finished designs that will fly out your door! Black Onyx protects against negative influences. It establishes deep concentration and reminds us of our inner strength. 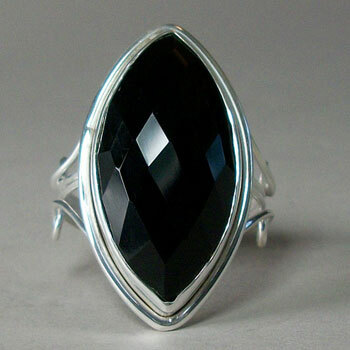 Black Onyx encourages us to follow our own path with courage. It prevents the draining of personal energy even while in the midst of chaos. You can count on Elaine for award winning designs. 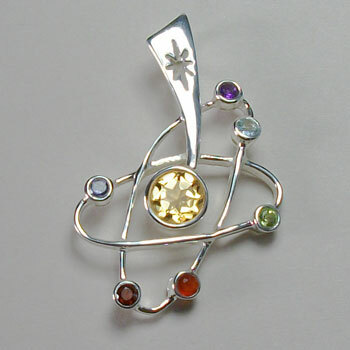 Our Solar Plexus Chakra won the COVR award at the INATS Show. The Solar Plexus is the source of all our energy and power. This new Chakra symbolizes nourishing citrine energy radiating out from our solar plexus to empower us, much like the sun’s force expanding across the universe. The cut out star decorating the bale completes the theme! This unique design makes for an interesting conversation piece. Feel free to call or e-mail Elaine with any questions or suggestions. She loves and respects your ideas. Have fun shopping for a happy and abundant season! 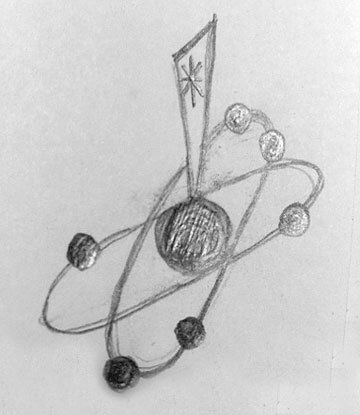 First sketch for our solar plexus chakra. 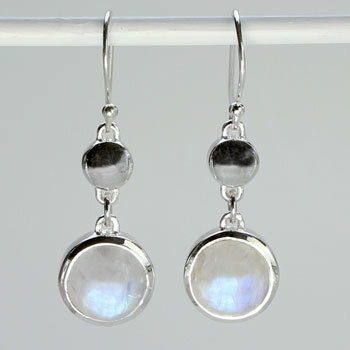 Solid sterling silver with genuine gemstones. While enjoying the sun and sea at the beach, my family and I began discussing how the sun is the power center of our source of energy as it spreads light, warmth and good health to all the planets revolving around it. Similarly, the solar plexus chakra located near the abdomen is made up of a complex network of nerves that connects to our heart and our life breath. According to the science of Ayurveda, our solar plexus chakra produces the fire of digestion, which is essential for well-being. When the Solar Plexus is in balance, one experiences a natural sense of confidence. I became inspired to create a pendant of our amazing Solar Plexus Chakra. Here is my first rough draft. We are happy and proud to announce that it won the COVR award at the INATS Denver Show this year! 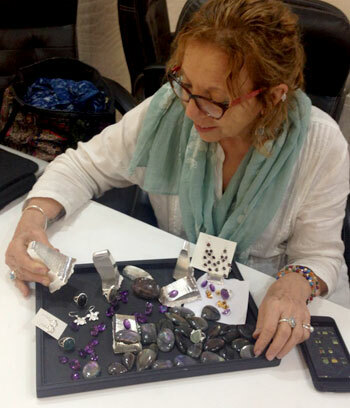 Elaine is in India this month creating new jewelry designs. These are pure raw silver bricks that Elaine will have melted down and fashioned into unique rings, earrings, pendants, necklaces and bracelets. 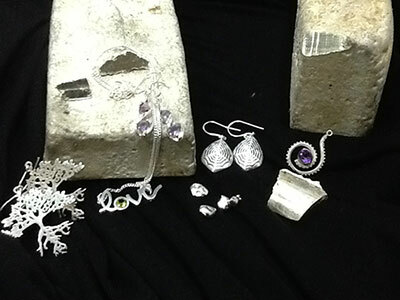 The unfinished jewelry shown in this picture adorning the bricks of raw silver is still a work in progress. She chooses the best quality natural semiprecious gemstones and makes sure all her jewelry gets a special high polished shine that lasts. Check our website because soon these beautiful new creations of wearable art will be up on our website! Meanwhile enjoy the special sales. While traveling through India to different villages and cities, I am creating new designs for all the amazing stones we purchased from all over the world. The first thing I did was to bring these rough stones to our stone cutters, making sure they shape and polish the stones to a brilliant shine. 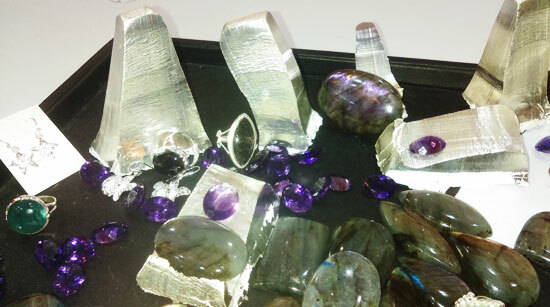 We are having our gem quality Cosmic Quartz (known as Super 7) cut into sparkly faceted and cabochon gemstones. 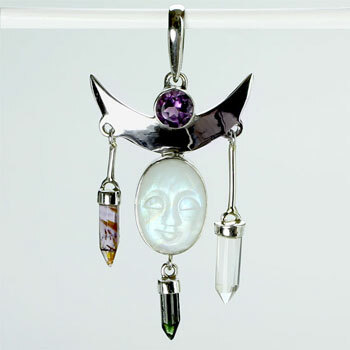 This metaphysical stone includes seven minerals corresponding to the seven Chakras, found only at one mine in Santo Espirito, Brazil. Our good friend who mines Sonoran Sunset in the Mexican Desert let us choose his most colorful slabs of this natural mix of blue-green crysacola and red cooperite. 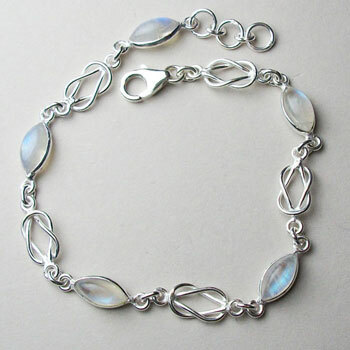 It makes a stunning piece of artful jewelry. The extraordinary Tiffany Stone, mined in Utah, is also getting cut into cabs and polished to suitably exhibit its amazing array of swirling colors from the thirteen natural minerals it contains. 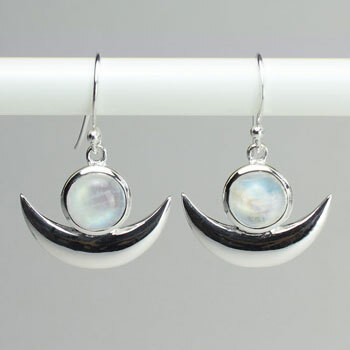 Esprit Creations is known for our superior quality of glowing Rainbow Moonstone and Labradorite jewelry. I have many new eye-catching design ideas for these attractive stones. You can also look forward to more new inspired chakra designs that are presently in the making! All the Best! I can’t wait to post some pics of my incredible new designs as soon as I get back to the states.